Gran Fiesta Tour Starring The Three Caballeros is located at Epcot's Mexico pavilion in the World Showcase and replaced "El Rio Del Tiempo" with a storyline and film featuring Donald Duck, José Carioca (the parrot), and Panchito (the Mexican charro rooster) from the 1944 Disney film "The Three Caballeros." Captioning Audio Description, Handheld Captioning. Why do they always change these things? Theres plenty of room in the park make new things instead of ruining the old. I like the 3 Caballeros but I miss the old song it was catchy and my grandma (RIP) used to sing it to me all the time. I also miss the hilarious spot on "Trying to sell you stuff" scene. The girl in it was cute too lol! but anywho, I still like the ride although the begining scene makes no sense now. Why couldnt they leave it the same and just be like having them take over the tour instead of just random unconnected events it could have been educational and funny. maybe have ponchito (sp?) telling about villages and the day of the dead and things like that then talking about cancun etc later on. Also its a lazy update because they didnt really do ANYTHING. Just switched the films. lazy lazy lazy! Relaxing and great theme! Has a couple good laughs and overall a perfect fun adventure. All though el rio del tiempo was a lot more calm and informational it made kids bored. 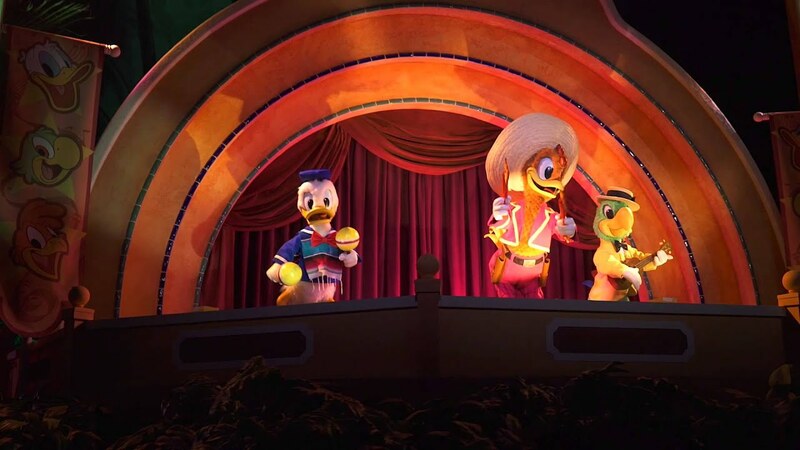 in the new version with the Three Caballeros kids seem more excited to go on and it is more whimsical and just feels more like Disney. Hint: on hot Florida days it is a good ride to do because it is inside and air conditioned An all around good ride. In all reviews, I would love to say that it's a nice, slow, relaxing ride. Like the former ride it replaced. Unfortunately, the loud sound of Donald and his two companions are filled through the whole ride. You're hearing Donald Duck all over the place and it's just so hectic in sound. The sound is just bunched up in the whole attraction.